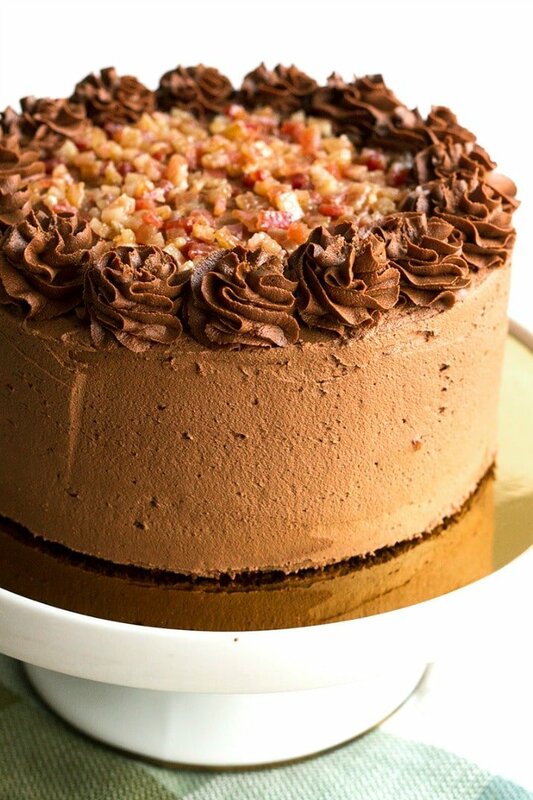 Brown Sugar Bacon Chocolate Cake is a decadent dessert layered with rich chocolate and candied bacon. One bite of this sweet & salty cake will have you falling in love! 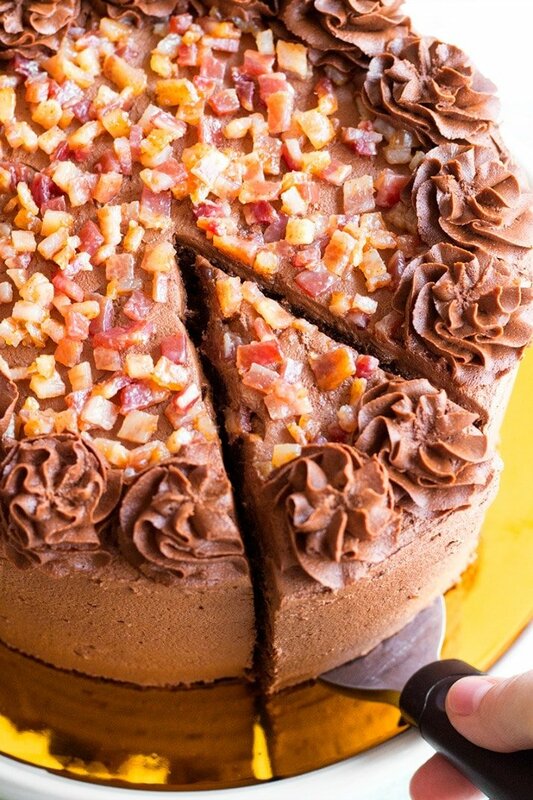 This Brown Sugar Bacon Chocolate Cake is one for the books! Chocolate cake has always been one of those desserts I just can’t resist. Whether it’s chocolate on chocolate, slathered with cream cheese frosting, or an ooey, gooey lava cake there’s something purely decadent about a great chocolate cake. 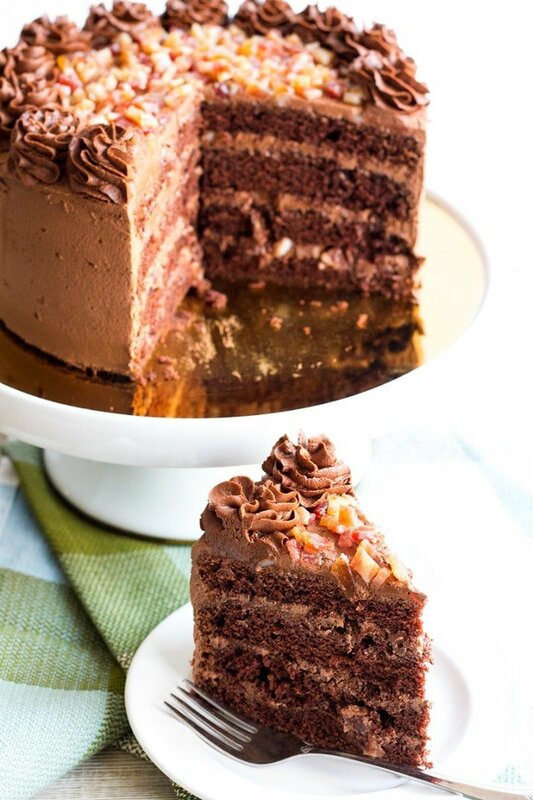 Today I’m bringing out my ultimate dessert obsession – sweet and salty + chocolate cake. We’ve all seen sea salt fudge and recipes like that where salt is used to boost the flavors going in the recipe. I’m one of those bacon freaks, and I just knew bacon would the perfect salty addition to compliment the chocolate of this cake. PIN IT TO YOUR DESSERTS BOARD ON PINTEREST! FOLLOW SUGAR & SOUL ON PINTEREST FOR MORE GREAT RECIPES! I’ve always been the type of girl to dip my french fries in my frosty. This chocolate and salt and fried potatoes are addictingly good. That flavor combination is exactly what this cake brings to the table, in a more fantastic way. The whole thing starts off with a rich chocolate cake, made with all brown sugar for depth of flavor and a little coffee to really boost things. 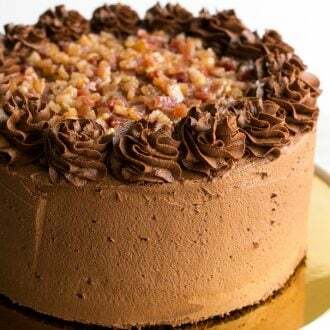 Then the cake gets filled and topped with the best chocolate buttercream, but we’re taking the filling to another level and mixing in candied bacon! Then decorate and enjoy! This cake is so incredibly delicious. If you’ve never had bacon in your dessert, this Brown Sugar Bacon Chocolate Cake will make you want to add it to just about everything. I can’t wait to make this recipe again. Next time I think I’ll turn it into cupcakes! If you’re obsessed with chocolate desserts too, try my Triple Chocolate Jack Daniel’s Cupcakes! They’re to die for! More delicious cake recipes you’ll love! 8-inch Cake Pans – I really love Fat Daddio’s pans because the even walls give you cakes a nice sharp edge! Cake Pan Liners – These are my favorite things EVER, there’s nothing worse than a cake sticking to a pan and these genius little liners ensures that yours won’t! Bake Even Strips – Another genius baking product I LOVE! These strips go around the pan after being soaked to deliver beautiful flat-topped cakes, no domes here! Frosting Spatula – Trust me, it’s so much easier to use one of these than a knife or rubber spatula! Piping Tip – This is my all-time favorite piping tip! It’s an extra large closed star tip so the results are big and beautiful! Cake Stand – A cake this epic deserves to be shown off, display it on a pretty cake stand before serving! Preheat oven to 350 degrees F. Grease and flour two 8-inch cake pans. Set aside. In a medium mixing bowl, stir together the flour, cocoa powder, baking soda, baking powder, and salt until evenly combined. Set aside. In a large mixing bowl, beat together vegetable oil, butter, and brown sugar until smooth, about 1 to 2 minutes. Add the eggs and vanilla, and beat until smooth. Scrape the sides of the bowl as needed. Add half of the dry ingredients to the brown sugar mixture. Mix until just combined. Pour in all of the buttermilk and mix until evenly combined. Add the remaining dry ingredients and mix until combined. Scrape the sides of the bowl as needed. Add in the coffee and mix until smooth. Pour half of the batter into each of the prepared pans. Bake for 30 to 35 minutes, or until a toothpick inserted in the center comes out clean. Remove cakes from oven and place on wire racks to cool completely. Preheat your oven to 400 degrees F. Line a baking sheet with aluminum foil. Place the brown sugar and cayenne pepper in a shallow bowl or on a plate and stir together. Dredge the bacon strips in the brown sugar mixture so they are well coated and place on the prepared baking sheet. Bake for 7 minutes, flip and bake for another 5 minutes. (Watch the bacon closely after you flip it. It can go from almost done to OH NO! quickly) Remove from oven and let cool to room temperature. Finely chop all the bacon. Reserve 1/3 of the bacon. Prepare Homemade Chocolate Buttercream according to the recipe. 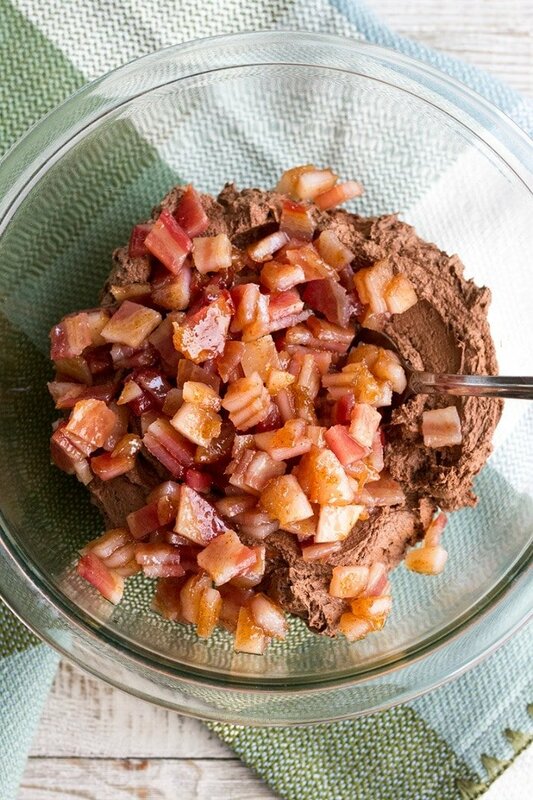 Portion about 2 cups of the buttercream into a separate bowl and mix in the other 2/3 of the chopped candied bacon. Level out the tops of each cake, and then cut each layer in half horizontally so there are 4 even layers. Place one bottom half cake layer on a serving platter or cake stand. Portion 1/3 of the bacon chocolate buttercream onto the layer and spread evenly out to the edges. Add a layer of cake, 1/3 of the bacon buttercream, and spread the frosting. Repeat once more. Place the last cake layer on top, bottom side up to give the cake a nice clean edge on top. Place 1/3 of the remaining chocolate buttercream in a piping bag fitted with a star tip. Set aside. Frost the outside of the cake with the remaining chocolate buttercream so the cake is evenly coated on the sides and top. Sprinkle the reserved bacon on top of the cake, leaving a 1-inch border around the edge. Use the piping bag to make a border or rosettes around the outer edge of the cake top. Refrigerate until ready to serve. If you don't have buttermilk on hand, you can substitute whole milk or 2% milk. The coffee can be left out if desired and replace with more milk. The coffee helps boost the chocolate flavor of the cake.